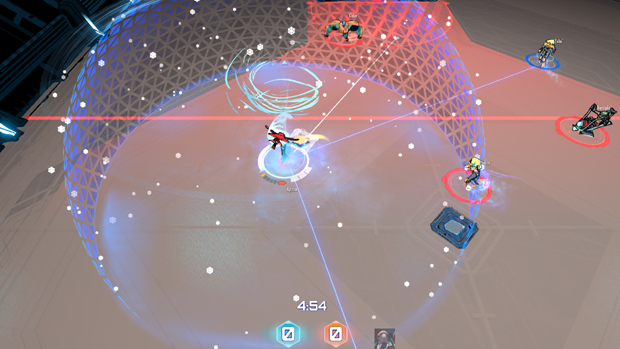 Arena: Cyber Evolution is an Early Access game currently available on Steam, created for the sole purpose of facilitating intense e-sports action. It’s being developed by Spearhead Games and they’re putting all their love for e-sports into this title. 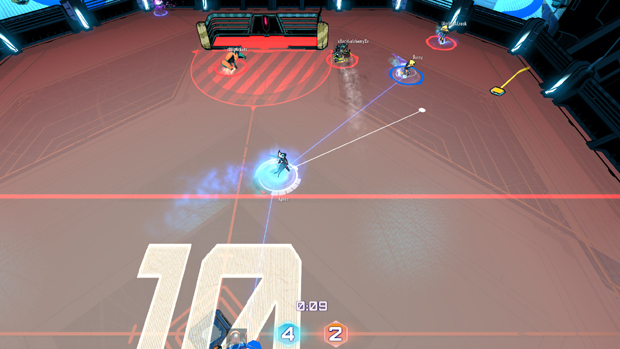 The goal of Arena: Cyber Evolution is to cash-in on the growing popularity of competitive play by providing a fantastic team-based game that has a striking resemblance to a few of the world’s physical sports, combined with the action-packed gameplay we find in MOBAs. The result? 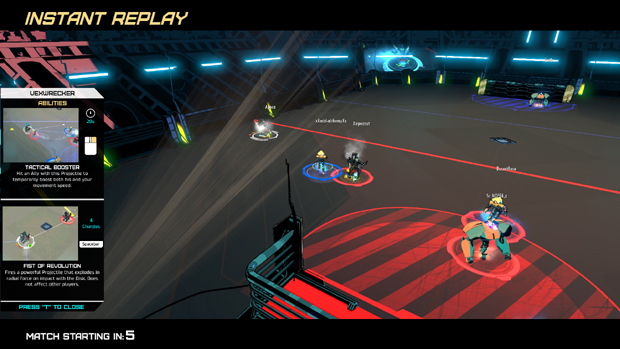 The world’s first MOSA – Multiplayer Online Sports Arena. And let’s not forget the catchy acronym, ACE. The goals are simple enough – you want to get the puck into the enemies’ net, while defending your own. With its teams of three, you generally get someone acting as “Goalie” with two others working on pushing the puck to the opposing side of the arena. What sets this apart is the MOBA-like characters that each come with their own special abilities. For example, one character has the ability to buff allies with a speedboost. Another can turn invisible for a duration and even teleport short distances. To turn up the competitive notch, the developers have it so you are only capable of using your abilities a few times a match. Each character has two abilities to make use of. The first, activated with the right mouse button by default, is a useful utility in most cases, such as the speed buff I mentioned before. The second ability is known as the “ultimate” and is activated by spacebar. This move can be a complete game changer when used correctly. Yet you will only get a couple chances tops to use it in a game, so its activation can be a clear sign of your experience, or level of novice at the game. 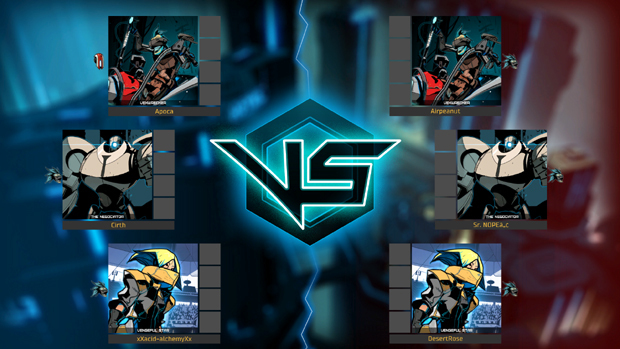 As I said, the game is played in teams of three, so a total of six people per match. I honestly would like it if more people were allowed to play. But the arena is the perfect size for that number of players. I’m hoping that later down the line there will be more gamemodes or changes that will allow for up to five people – especially considering that while I was playing with friends, we ran into the issue of not all of us being able to play on the same team. 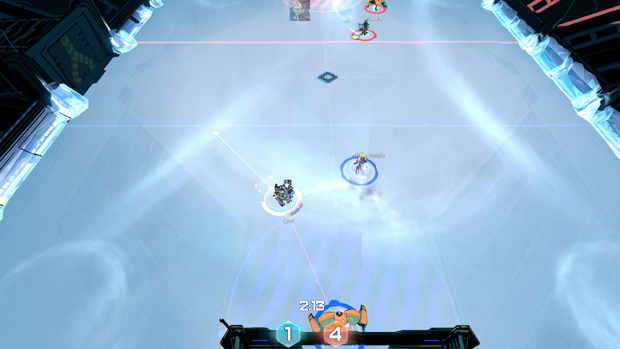 While we still had fun, it was a bit frustrating due to the small team sizes. The matches themselves tend to go by fast. Each match only lasts a few minutes, with the count-down starting whenever the puck is in play, and stopping when it’s not. Whoever has the highest score when the count-down of the match is over, wins. I like this because it keeps the matches short and sweet, rather than long and drawn-out affairs. It also makes it a lot easier to play when I’m lacking the thirty minutes to an hour necessary to be sure my match of SMITE, League of Legends, or DOTA 2 isn’t interrupted early. So far, character selection is fairly limited. I’m guessing they’ll end up adding more as time goes on. They all seem balanced and set up for one role or another. You do run into the typical MOBA ‘archetypes’ which I think are neat. 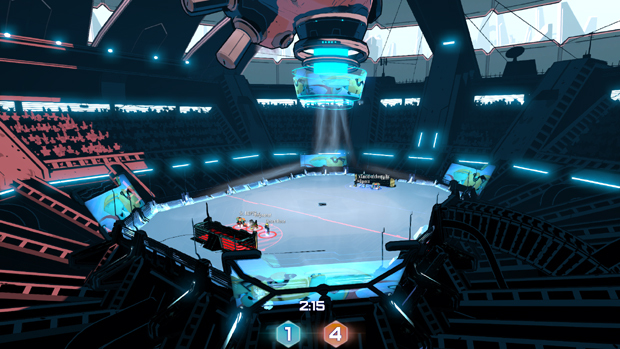 For example, the big burly robot essentially fills the role of a tank in a typical MOBA, and is often left to be the goalie. I found it interesting that my friends who I play MOBAs with fell into similar roles as they would when playing something like Smite, while playing ACE. There is a bit of progression in the game. As you progress, you can unlock certain upgrades that can be applied to characters to give them some boosts in matches. If you’re willing to pay a bit of money, you can also get cosmetic items and skins for the characters. 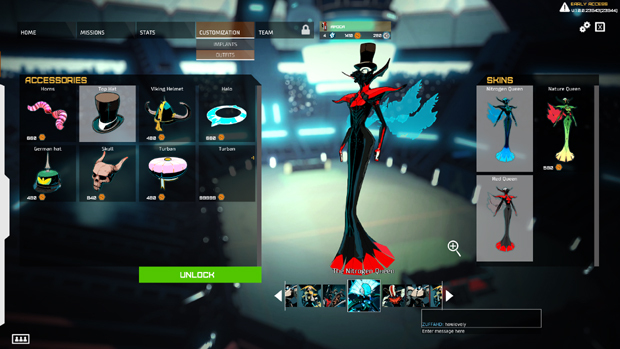 Setting up my Nitrogen Queen with the Red Queen skin and Top Hat was nice. I wish more of these types of games allowed for more customization than just the skins. You’ve noticed my mentioning of “the field” by now. The field in ACE is fairly special. Due to its cyber-nature, it isn’t bound to the same static changes that we have in reality. For example, it’s not uncommon to find strong winds blowing you about, or having the arena suddenly turn to ice to make movement a bit more slippery. I’m guessing these weather changes are to keep things interesting and provide an element of randomness, and they certainly accomplish that. Other than that, the arena is fairly standard. Walls around the edges, two goals, just enough room to allow for a bit of travel but small enough to keep things interesting. At times, though, I did feel a bit claustrophobic with the size of it all. 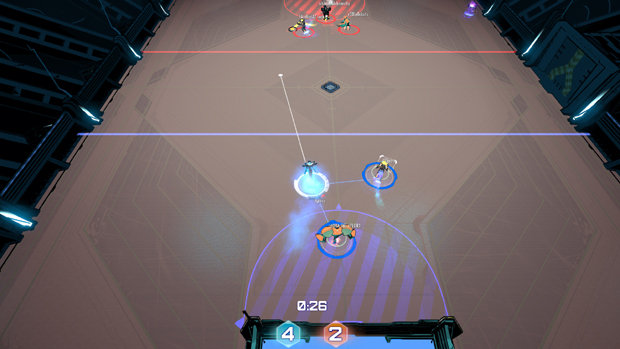 I personally like a lot of room for movement and with the current map I feel it’s a bit too easy for players to cluster together and turn the game into a bumping/puck stealing fest. It’s a bit hilarious to see four players spinning around, losing and stealing the puck over and over until someone eventually manages to grab it and move enough to make a shot. The graphics aren’t super high-quality next-gen, but they can be pleasing to the eye. That being said, I do hope that the devs release some higher graphics settings. This is especially needed when it comes to the character models. During some portions of play, even at the highest resolution and settings, I noticed that some of the characters looked a bit pixel-y. And this is only an issue while in a match – at character selection, the models look fantastic. It’s not a major problem, but I don’t see why keeping the graphics low quality would be a need in this game, especially with the power of most modern machines. Anyone who plans to play a game competitively will have invested a few hundred dollars in their machine. Perhaps it’s just the nearly top-down perspective the game is played at and how zoomed out you are that creates this effect on the character models? The arena looked fantastic. It had a very nice futuristic feel that matches the “cyber” theme of the game. Again, though, when you look at something a bit close, you do notice a blocky/simplistic nature to it. I’m not sure if this was done on purpose of aesthetics (League of Legends in much the same way), to reduce on the system requirements, or if they’ve just not released the fully polished map skin into Early Access yet. All that said, as long as you’re looking at the whole (which is most of the time), there’s nothing to complain about. 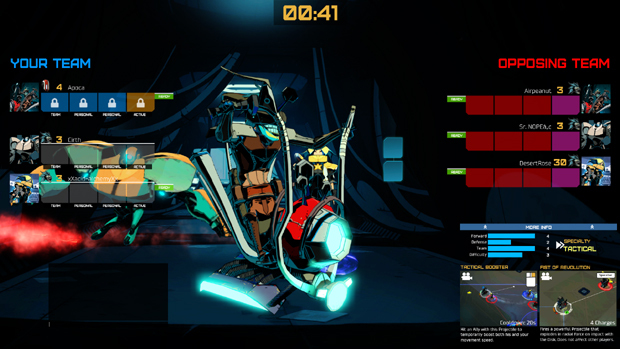 Whenever a score is made, the game immediately goes into an “instant reply” mode and displays the moments leading up to the score. I found this extremely helpful, as a lot of the time things go by so fast you don’t realize how you managed to lose the puck and have the enemy make a point. It also shows the reply from different angles and perspectives, which can be quite enlightening. I found myself improving rapidly thanks to this feature, although a couple of my friends did find it a bit annoying rather than a blessing. 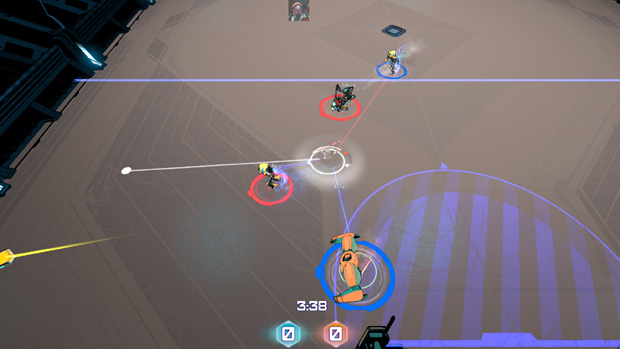 Arena: Cyber Evolution, or ACE, is shaping up to be quite the fun game. There is some room for improvement, but that’s to be expected of an Early Access game. What’s surprising is all the things Spearhead Games is doing right. When I was first introduced to the title, I was a bit skeptical – I feared this would just be another attempt at re-hashing and cashing in on the MOBA craze. However, I was delighted to find my fears were unfound, and I was able to have a blast with the game. Definitely check it out if you’re looking for a new F2P competitive game. You can currently find ACE on Steam and hop into the game for free! Want more ACE? Catch JamesBl0nde’s Refresher video! Brick-Force begins open beta today with opening access to VIP keys and registered players. SMITE Lore: Who is Fafnir?